A campaign has been launched to help improve the safety of pupils by urging "selfish" parents to stop parking dangerously outside schools. Parents are being reminded that childrens' lives are being put at risk by vehicles parked at school entrances across Aberdeenshire. Head teachers have become particularly concerned about motorists dropping off youngsters outside school buildings in Westhill and Inverurie. 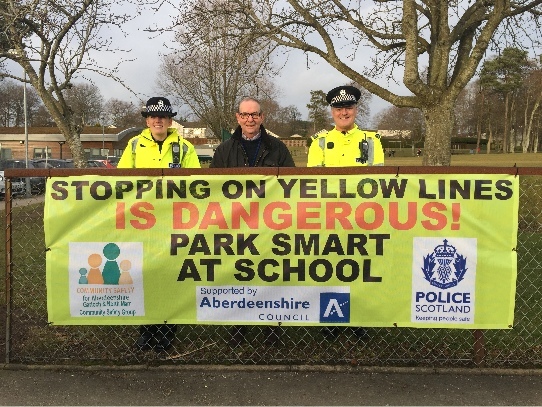 Police joined force with the Garioch & North Marr Community Safety Group to put up colourful banners outside five schools in the area urging motorists to obey road rules. "It is a serious issue in the area. "Most parents are sensible and do what they are supposed to and park responsibly. "It is unfortunate that there is inconsiderate and sometimes dangerous parking by a minority of parents when dropping off their child at school. "We hope erecting banners with a warning notice will prompt parents to be more considerate during the school run." Constable Steven Middleton said he though it would tackle the "selfish and unsafe" behaviour of parking illegally outside schools. "The vast majority of parents arrive early to drop off or pick up their children and park responsibly. However, there are always a few who turn up at the last minute and park on the double yellow lines or on the zig zags, causing a danger to the pupils leaving the school to walk home. "While police take a robust approach to illegal parking outside schools, officers can't be at all the locations where irresponsible parking is occurring and these banners will help to press home the message that it is selfish and unsafe to park illegally outside a school." The banners will be displayed at Elrick, Strathburn, Insch, Newmachar and Kemnay Primary Schools.